Shamir Patel, pharmacist and founder of Chemist-4-U.com said: “Many people confuse the two, mistaking the flu for the common cold. “I define the difference between the cold and flu as this: if you have a cold and you see a £50 note floating around your back garden you’d go out and get it. Symptoms of the flu include fever, chills, headaches and aching muscles, as well as a cough and sore throat, and you’re likely to need to spend two or three days in bed. In severe cases, the flu can lead to death among vulnerable groups such as elderly people and those with underlying health conditions. Meanwhile, symptoms of the cold include a blocked or runny nose, coughs, sneezing, a sore throat and a temperature. While it can make you feel pretty lousy, it’s unlikely to lead to anything more serious. Shamir said: "While they both affect the respiratory tract the common cold and flu are caused by different viruses. If you’re hit with the flu you should rest and keep warm. Make sure you’re staying hydrated with plenty of fluids and treat your aches, pains and fever with paracetamol or ibuprofen. For a common cold the advice is the same. Both should clear up in around seven days as long as you look after yourself. 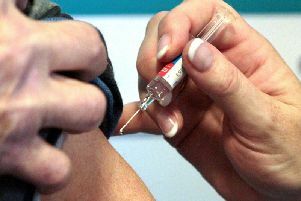 The best way to prevent yourself from getting the flu is with a vaccination. The flu vaccine is offered for free on the NHS to people who are at risk, including those over the age of 65, pregnant women, and people living in a long-stay residential care home. The vaccination is also available to people who have underlying health conditions such as long-term health or respiratory diseases. The best time to have the flu vaccine is from the beginning of October until the end of November, but you can still have it later in winter if you miss it earlier on. Other ways to prevent yourself getting the flu, or to stop it from spreading, include washing your hands regularly with soap and warm water, covering your mouth and nose when you sneeze, and disposing of tissues properly. It’s also a good idea to avoid close contact with sick people and to avoid touching the eyes, nose or mouth. Serious side effects from the vaccine are very rare but you might have an achey arm from where you were injected. Shamir said: “A flu vaccine won’t stop you from getting a cold, however, so the best course of prevention for this remains washing your hands properly, and not sharing towels and cups with people who have a cold. “It is possible to spread the cold germs before you get sick, so washing you hands and covering your mouth and nose when there are sneezes around is always a good idea. “If you sneeze on your desk at work, wipe it down immediately. Also, be aware the viruses can live on tissues and clothes for 12 hours."